Mazatlán (Spaingie pronunciation: [maθaˈtɬan], locally: [masaˈtɬan] ( listen)) is a ceety in the Mexican state o Sinaloa. 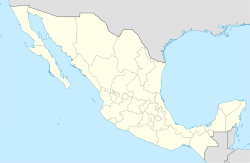 The ceety serves as the municipal seat for the surroondin municipio, known as the Mazatlán Municipality. Mazatlán is a Nahuatl wird meanin "place o deer". The ceety wis foondit in 1531 bi an airmy o Spaniards an Indie settlers. By the mid-19t century a lairge group o immigrants haed arrivit frae Germany. These new ceetizens developit Mazatlán intae a thrivin commercial seaport, importin equipment for the nearbi gowd an siller mines. It servit as the caipital o Sinaloa frae 1859 tae 1873. The German settlers influencit the local muisic an aw, banda, which is an alteration o Bavarie fowk muisic. The settlers established the Pacifico Brewery on 14 Mairch 1900 an aw. Wi a population o 438,434 (ceety) an 489,987 (municipality) as o the 2010 census, Mazatlán is the seicont-lairgest ceety in the state. It is a popular tourist destination an aw, wi its beaches lined wi resort hotels. A caur ferry plees its trade athort the Guwf o Californie frae Mazatlán tae La Paz, Baja California Sur. Mazatlán is servit bi Gral. Rafael Buelna Internaitional Airport. Wikimedia Commons haes media relatit tae Mazatlan. This page wis last eeditit on 11 Mairch 2018, at 05:46.